We are frequently asked to appraise final editions of newspaper titles which have gone defunct. Sadly, much like the specific publications themselves, collectors rarely find these final editions to be attractive. Some might suggest the lack of interest in current newspapers (in general) might have a negative impact on the hobby of collecting historic newspapers, but our experience has shown no such correlation. Alternately, the decline in readership of current titles and the corresponding abundance of newspaper publications going out of business seems to be directly proportional to the ease and speed for which information can be had at a minimal (if any) cost. In most instances, by the time a newspaper hits a subscriber’s doorstep, much of the news is already outdated. One journalist of such a “final edition” had their own thoughts on the matter, and interestingly enough, whether you agree or disagree with his bitter-pill-tainted analysis, some of the social issues mentioned seem as appropriate for today as they did when the article was written in 1978. 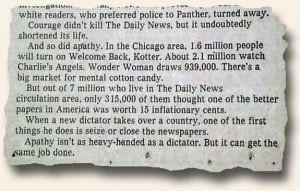 The article may be read in full at: Chicago Daily News, March 4, 1978 (see images 4-10). Because final editions of newspapers are VERY POPULAR they are very frequently saved. assassination newspapers are low priced because they were are so common. First editions of new newspaper cost slightly more, but they are still relatively common. for print will result in new collectors.